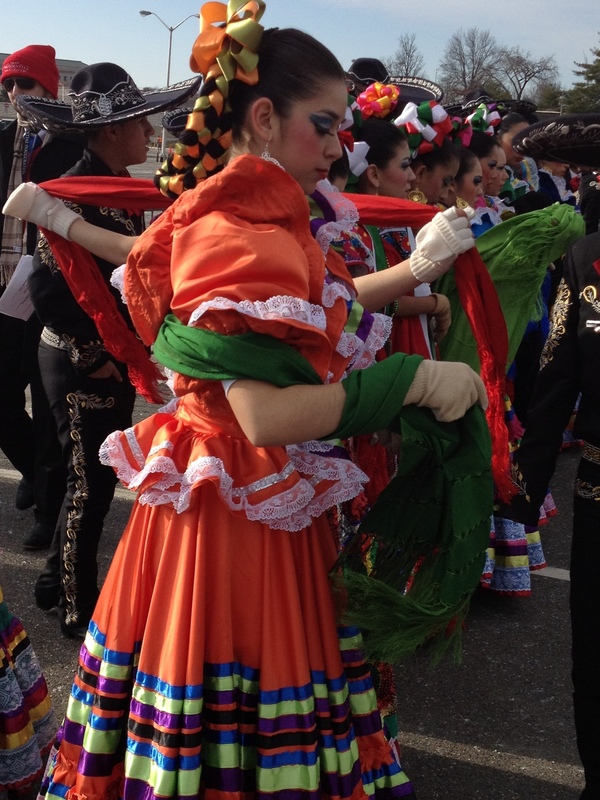 Inauguration Ceremony: Memories In The Making : The Two-Way Along the streets of the nation's capital, visitors prepare for inauguration ceremonies. 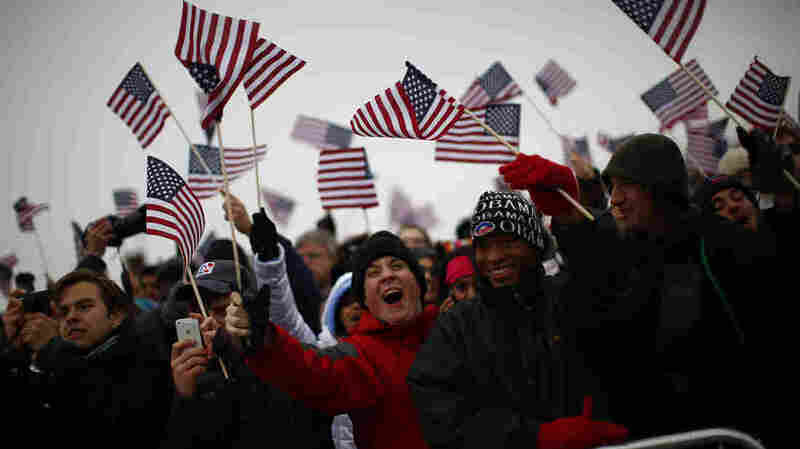 Spectators react on the National Mall during inauguration ceremonies for President Obama. A crowd walks through downtown Washington, D.C., toward the National Mall. "I'm looking for Washington to start getting along. I mean nobody's working together. And both sides have got to give a little bit and they've got to come to some agreement on some things." -- Alan Dillon, 50, elementary school principal, Western Slope, Colo.
"I'd like to see immigration reform, of course, go through. I'd like to see more focus on climate control. I think that's really, really vital. Gun control ... and a lot of more programs for the poor and for those who are a little more vulnerable in society, which needs to be addressed." -- Chris Karl, 48, yoga teacher, Laguna Beach, Calif.
"I'm hoping for unity more so than anything within the Congress and Senate and everybody, so that we can get together and have one cause." -- Ron Gibson, 65, retired UPS driver, Dayton Beach, Fla.
Members of Palmview High School's marching band and folklorico group, who traveled from La Joya, Texas, prepare for the inaugural parade in Washington, D.C.
"As far as the eye can see there are people! You know, and looking at it on TV is not the same as in person. It just means so much more just to see [that] all these people got up this morning to get here. It's amazing, just amazing." Kelsey Sutla, 16, who traveled by bus with her classmates from Caro High School in Michigan, said gun control is an issue she'll be watching during Obama's second term. "Guns are big in our city," said Sutla, who lives in Caro. "We all go hunting. So it's a real big thing for us. We don't want guns taken away. But my personal view is, I feel like assault rifles and things like that are not necessary. When you're hunting, you don't need that." During the president's speech, American University student Eliza Bertrand cheered as Obama described the movement to ensure equal wages for women. "It is now our generation's task to carry on what those pioneers began," Obama said in his speech, as prepared for delivery. "For our journey is not complete until our wives, our mothers, and daughters can earn a living equal to their efforts." He then extended that comparison to the LGBT community, saying, "Our journey is not complete until our gay brothers and sisters are treated like anyone else under the law — for if we are truly created equal, then surely the love we commit to one another must be equal as well." Bertrand said she hopes to see gay marriage become legal in all 50 states. "Anything we can do to move toward that future in whatever ways possible [is] very important," said Bertrand. Among those congregating along the National Mall Monday were a group of seniors from Detroit, who spoke with NPR's Sonari Glinton. Minnie Rose told Glinton: "We're a little too old to see the next black president. We'll be gone with the Lord." 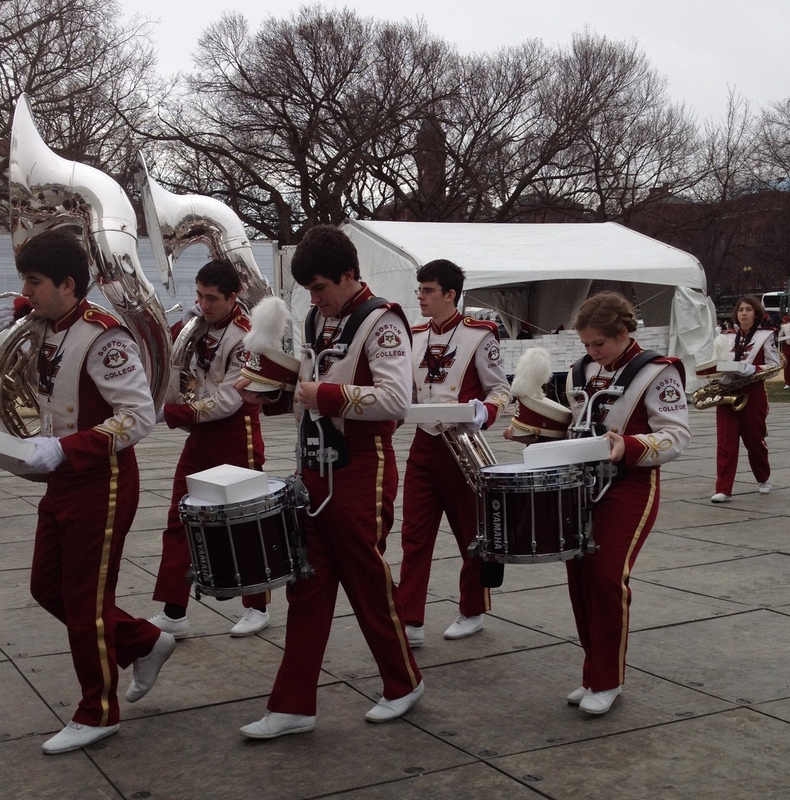 The Boston College marching band tunes up prior to performing along the National Mall. Rose would not give her age, but her friends hinted she's in her 80s and said she wasn't able to attend President Obama's first inauguration, so it's important for her to be here and see history being made. 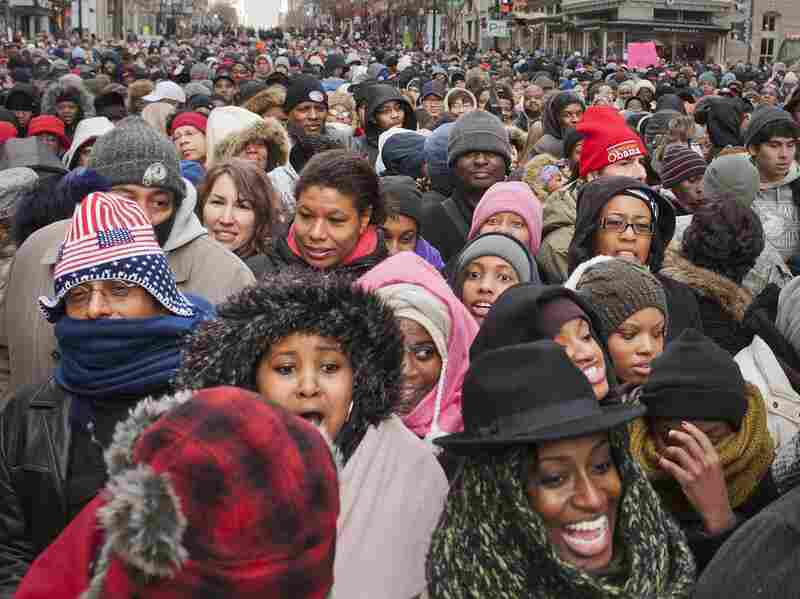 Others, like Carmela Gaines of Far Rockaway, N.Y., recalled how crowded it was during 2009, telling NPR's Brakkton Booker that she was thankful to just be standing on the grass of the Mall this time around. "We didn't see anything; we came by Amtrak. We got off at Union Station," Gaines said, describing the same event four years ago. "We were across the Capitol at the Blue gate, but we had to listen to it on the radio." Just months ago, Gaines and her mother were stuck in their New York apartment without water or electricity for two weeks after Superstorm Sandy. 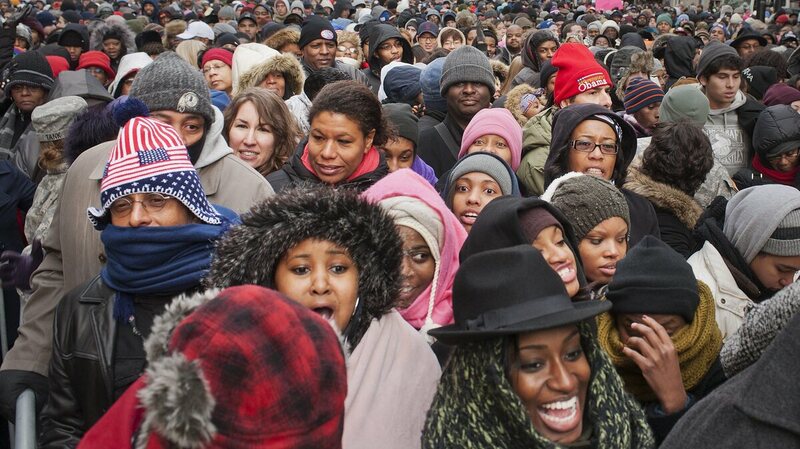 But they said they never doubted they would make it to D.C. for Obama's second inauguration. NPR's headquarters are several blocks from the Capitol and the National Mall, but a steady stream of inauguration activity began almost as soon as daylight broke Monday morning. Since many of the streets are already blocked off, most of the activity was of the pedestrian variety. Loretta Pittman of Philadelphia was taking her young daughter to the ceremony. It was the first time ever in the nation's capital for both of them "and we're very excited," Pittman said. Robert and Doris Johnson Brown were in from Milwaukee. "We just thought it would be a great thing to do. ... This will be the last time around," Robert Brown said. But the ceremony itself won't be the first celebrating the couple have done this weekend. They attended the Illinois state ball Saturday night, "which was really fabulous," Robert Brown said. This morning they were on their way to the Gold section, said Doris Brown, courtesy of Rep. Gwen Moore and Sen. Tammy Baldwin. "We're very proud of both of them," she said. "They work very hard." And while the crowd is, by most estimates, considerably smaller than in 2009, that's not putting much of a crimp in the attempts at commerce. Greg Stryker was in charge of the Pepsi promotion at the corner of 7th Street and Massachusetts Avenue NW, where volunteers were handing out free cans of Pepsi and Pepsi Next. "It's the perfect nexus of people and pedestrian traffic, and the festival atmosphere and the amount of people that come down for inauguration," he said. Meanwhile, outside the Gallery Place Metro station, Jeremiah Ulmer was selling one of many Obama-related souvenirs. "I'm selling inauguration ceremony tickets, from the first one and the second one," he said. Actually, the tickets wouldn't get you into anything; they're commemorative only, on bright blue lanyards, with an "I heart Obama" button to hold them together. But for $10, "you can't beat it," he said. And how's business? "I don't know; I just came out," he replied. That's OK, the crowd should be around for a while. Out on the Mall, the fact that President Obama is being ceremoniously sworn in on the same day as Martin Luther King Day held a certain significance for some visitors. Beverly Johnson, who traveled from Hopkinsville, Ky., said Obama os picking up where King left off. "I feel like he wants equal opportunity for everyone," Johnson said, referring to President Obama. "It doesn't matter the color of your skin." John Bennett, 71, who traveled from Fort Valley, Ga., said he's "overjoyed" to witness the inauguration ceremonies. "In my lifetime, at my age, I'll probably never see this again," Bennett said, referring to the historic re-election of the nation's first black president. He then quickly added, "I might be wrong." NPR's Jeff Brady, Brakkton Booker, Julie Rovner, Sam Sanders and Padmananda Rama contributed to this report.